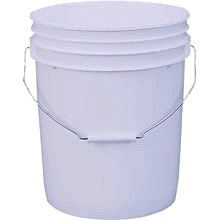 PRODUCT: 5 GALLON HEAVY DUTY HDPE PLASTIC PAIL, 70 MIL THICK, WITH METAL HANDLE. (LID NOT INCLUDED). LEAKTITE #P5GL OR EQUIVALENT. PRICE/EACH.